Way back on my January 8th post I listed some resolutions here on the blog. They were primarily knitting goals and resolutions, although I l did add some non-knitting resolutions at another time. How did I actually do with them? Only so-so. Navy Tweed Vest, is for me, and still languishing in a project basket beneath another project. Not accomplished. Stonehenge Hickhiker, was also for me. That was finished back on January 18, plus another later in the year. Accomplished . Sandy's Traveling Woman Shawl was finished in May, in plenty of time for her cruise. Accomplished. Rustic Blue Silk Triangle. This was from stash yarn purchased for my birthday a couple years ago and shown above. Accomplished. 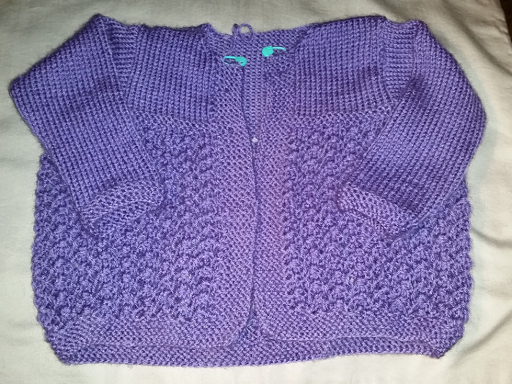 Lilac Cardigan, for the Purple Princess. I almos frogged it but I was successfully completed January 30. Accomplished. 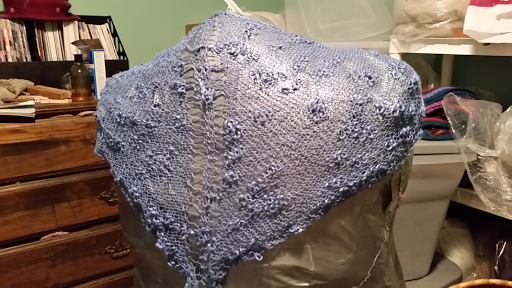 Baby Hap Shawl, also for the Purple Princess. This is hiding the tweed vest. It just needs the last bit of lace edging to be completed. It would have been done but this fall was too hot to have a pile of fluffy wool on my lap. Not accomplished. So, I did complete four out of six that I listed then. And, added several more, including some for my own Little Peanut. Number 2 resolution was to knit one or two cardigans for me. I even listed the yarn from my stash that was to be used. And while I did cast one a new cardigan, using new, not stash, yarn, my Freyja is still sitting, although close to the arm divide. This resolution is a total failure. Resolution 3--more socks. Hmmm. I started one with a Craftsy Class, that's past the heel on sock one. I took a class at the local yarn shop, learning the Fleegle Heel and have 1 1/3 sock done. 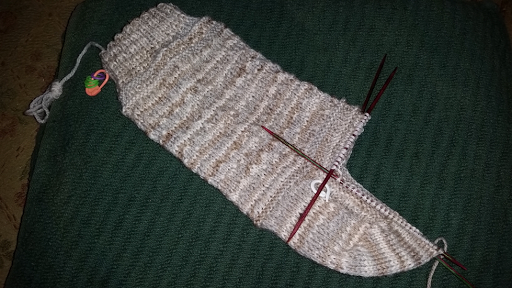 And a started a plain vanilla sock, using the Fleegle Heel. It is half done. And the previously started Broken Seed Sock still sits as well. No usable pairs of socks...not accomplished. Number 4 was to finish more of my Craftsy classes. I did finish a couple. But bought a few more. Oops. Not accomplished. Not very good returns, but at least I had goals. I may rethink the WIP resolution again. It kept me motivated. I mentioned additional goals as well. I had hoped to blog more often. Since this post has me tied with the second most posts per year, I think I did all right. Even if I didn't come close to posting daily. One goal for the year was to explore my options in changing my church home. I took the plunge the end of January and am very pleased with my new situation. My soul is being fed again. On the goal of handing out random compliments, I could have done better, but did do some. I may need to resolve to review my goals monthly, to help on that one. Lastly, I added the goal of crocheting a sampler scarf and mitts, after taking a crochet class. 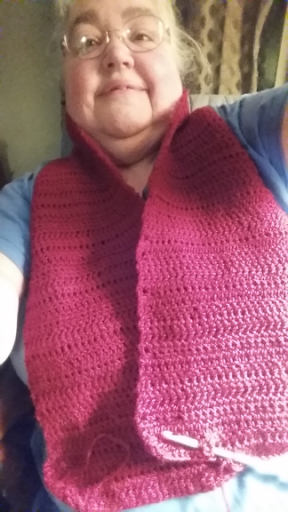 My heart still belongs to knitting, but this goal was also accomplished. Since Advent is the start of the church year, I have started thinking of ideas for resolutions, or at least goals, for 2017. Maybe I can do better next time. What's a Grammy to Do?